A BUBBLING CAULDRON: White Supremacist Gangs In Costa Mesa? 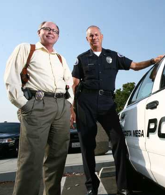 This morning the Daily Pilot will carry an excellent article by Joe Serna discussing the retirement of two Costa Mesa police officers - Bob Phillips and Clay Epperson. You can read Serna's piece HERE. So, what's the big deal about two cops retiring, you ask? Well, both men are taking advantage of the recent retirement incentive program, but that's not why I'm writing this tonight. WHAT WILL "THE MOUTH" SAY? Nope, I writing this to speculate about what kind of a response it will generate over at the Mesa North repository of hate, the CM Press. Epperson is quoted by Serna as saying that his greatest accomplishment during his 29 year tour with the CMPD was working with detectives while on the Special Enforcement Detail to "kick out white supremacist gangs." He went on to say, "Those are some really evil people that do severe harm to the communities they're in." From time to time our racist laureate at the CM Press has vehemently denied that there is a white gang problem in our city, preferring, instead to berate the CMPD for his perception that they don't do enough about Latino gangs. So, who's word will you take? Will you listen to an internationally notorious racist with a long career publishing anti-anything-but-white tripe and who has demonstrated a clear pattern of behavior designed to disenfranchise and dislocate the Latinos who make up approximately one-third of our population? Or, will you listen to a decorated police officer with almost three decades serving our city, trying to make it a safer place to live, work and play? Gee, I think Epperson's got my vote. Regardless, thanks to Phillips and Epperson to their years of dedicated service to our city. They both deserve a happy, safe retirement. The city will have to fill a big void. Both of these "cops" were big assets to CM. Thanks to both of them for putting themselves on the line every day. Best wishes in your new directions. Clay has been an incredible individual and a great Teniente. 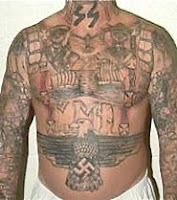 He's done an excellent job in the community, not only cleaning white gangs out of our neighborhoods, but also Latino gangs. Let's face it. We have gang issues in the Latino community. Clay thank you for devoting your life to get us a better place to live, and thanks for getting involved in local politics, event though sometimes it doesn't pay well. See you soon. Hope you decide to run for an elected office. Saludos.